It's insane just how popular blogging actually is. Iâ€™m doing it. You could be doing it. But think about how many blog posts are out there and think about how many of those donâ€™t get read. 8 out of 10 people will read your content, but only two out of 10 people will actually click through to read it. That just goes to show that youâ€™ve got to do something extra special to get people onto your blog and Iâ€™m gonna share some of those with you today. #1 | USE THE WORDS "YOU" AND "I"
Blog posts are all about having a conversation with your reader and thatâ€™s why using the words â€œyouâ€� and â€œIâ€� is so important. Even when I make videos, I say things like â€œyouâ€™ve got to do something extra specialâ€�, or "this is how Iâ€™m going to help you today." If they donâ€™t feel like youâ€™re talking to them, theyâ€™re just going to feel really bored and leave. When youâ€™re actively having a conversation with them, theyâ€™re more likely to read your content and engage with you on and off your blog. And by short, I mean five or six lines max. The moment they go over that, your reader will become too overwhelmed and you guessed it - theyâ€™ll leave. There are a lot of times when people will leave actually. But people donâ€™t want to read large chunks of text. Take a look at this blog post for instance. A lot of my paragraphs are two or three sentences and some are just a few words long. Weâ€™ve spoken about this before but subheadings really help to break your content down for your reader. Subheadings help people to understand what your post is all about. Without them youâ€™re just making life more difficult for your reader and that means youâ€™ll get fewer readers. So with a subheading, if thereâ€™s a particular section people want to navigate to, they can. Your readers will really appreciate that because youâ€™re taking their reading habits into account. So many people donâ€™t do this and itâ€™s something that I tell all my blog coaching clients when I do a review of their content. A lot of people think they donâ€™t need a conclusion but you do. A conclusion should be in your blog post template, it needs to be in there. Youâ€™re just keeping it really simple, but youâ€™re letting people know what your blog post is all about. Itâ€™s like saying okay, this is what youâ€™ve just learnt. A lot of people read the conclusion first. Itâ€™s like when youâ€™re thinking about buying a book and you read the last few lines on the last page. Your readers can then decide whether they want to scroll back up to the top and read your blog post. But itâ€™s actually a really popular pattern that people do. If youâ€™re sharing a fact or a stat, donâ€™t just write it without linking back to the source. If you donâ€™t link back to it, your readers might think youâ€™re making things up or you donâ€™t know what youâ€™re talking about and then they wonâ€™t come back. Using graphics and images helps to explain the message or point that youâ€™re trying to get across. This is a great way to help people stick around on your blog post which will increase your time on page. And by this I mean make sure itâ€™s thorough and actionable. You want people to finish reading your article and then think â€œthis is great, Iâ€™m gonna go do this nowâ€� or "Iâ€™m going to add X to my to-do list so I can try this out." The worst thing for your reader is when your headline says your article is going to deliver something and then it doesnâ€™t deliver it. Youâ€™re not gonna go back to that site if it wastes your time. 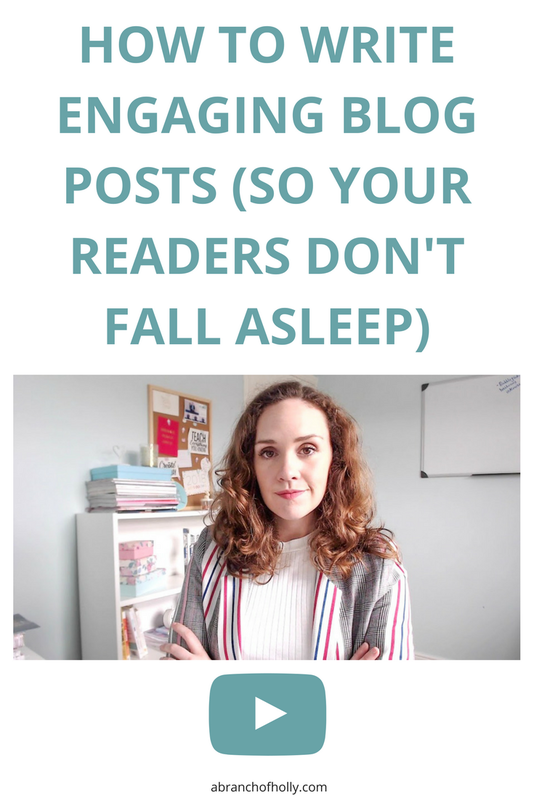 If you implement even one of these tactics, I promise you your readers wonâ€™t fall asleep. Even if theyâ€™re really really tired! Which one of these tips are you going to implement first? Let me know in the comments! Remember to boss your blog posts so your readers don't fall asleep, so you can get one step closer to a breakthrough.